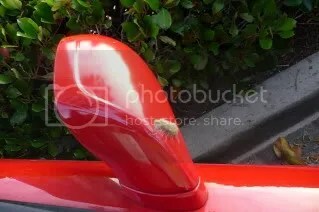 * Remember the cat barf on my car I mentioned a couple weeks ago? i wasn’t sure how the barfer could top getting barf down in my gas filler area, but I am now able to tell you. For Friday the 13th last week, the Barfer barfed on the side mirror… and my hood, but the side mirror is the one that mystifies me. Trying to figure that one out… like, if it were bird crap, I could totally understand how it happened, but a cat? Mystifying. * Also, on Friday the 13th, the coffee maker at work went out. Our Facilities Manager created this sign for the occasion and vehemently denied it being a Friday the 13th gag. 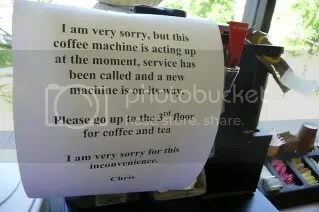 I finally believed him when I saw the coffee machine fixing man out on Monday working on it. * Did you know there are people whose job it is to go around to companies and restock their first aid kits with band-aids and Tylenols? I sure didn’t, at least not until I saw some dude in a uniform restocking ours at work. I’m still pondering what the guy puts on his resume as his official title. Also, what his qualifications have to be and how would one go about landing that kind of gig? 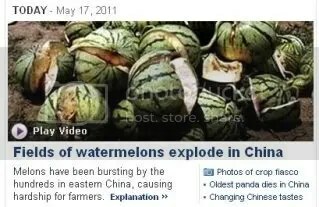 * Given my love for watermelon, and all melons in general, I have to say this story made me really, really sad. * The owner of a company who partners with my company told someone pretty high up at my company that I am one of the nicest, most helpful people he’s ever worked with. He phrased the compliment in such a way that it sounded like he’s worked with me for years, although he hasn’t. Just goes to show that things do go through the grapevine, both good and bad. I’m glad this one was good. * LivingSocial.com offered a deal with Fandango, 2 movie tickets for $9. Of course, I was all over that! We’re presently scheduled to see the new Pirates movie on Saturday morning and I can’t wait! Per Tony’s Movie Rules of Conduct, if the movie we’re going to see is a series, we have to watch all previous movies prior to seeing the new one… so, we’ve been watching all the previous Pirate movies this week. It’s a good thing I’ve been in a movie mood lately. * Update on the washing machine fix… Tony determined that the broken part was actually a $30 part that we could buy at Sears. Once it was in, tested, and proven to be working, I called the company from whom I had ordered the $100 Brain/timer and asked to return it. 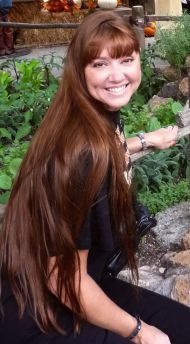 In the course of the conversation, they learned that the part had actually been delivered slightly damaged. I told her it wouldn’t affect the operation at all, it’s just one of the four clips that hold it in place, the other three are just fine. She said not to worry, just go ahead and discard the part (umm, right, that will be happening) since they can’t sell it damaged and she would process the refund to my credit card. * Last week, Tony’s parents went up to the family cabin in the mountains. For breakfast, they went to our favorite restaurant, pointed at our picture on the wall, and said they wanted one of “those messes for her” (“her” being me). The waitress knew exactly what order to put in for that (the Mess, no cheese, extra jalapenos), and then that night, my in-laws delivered said Mess to me at home. To say I was astounded and touched at their thoughtfulness would be an understatement. 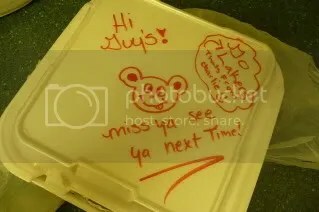 Then, when I opened the bag and saw these messages from the crew at the restaurant, I nearly cried. You guys, sometimes (a lot of the time), I either forget or don’t believe it, but I am so very loved. Also, in case you were wondering, the breakfast is delicious. I separated it up into tortillas and rolled them up into “breakfast burritos” and froze them. There was enough for six of them. First time doing that, and it won’t be the last.